The Packrat Crafters 4-H Club installed new officers for 2017 recently. Pictured (L to R): treasurer Samantha Moore, safety officer Emilee Wilson, secretary Emma Whistler, news reported Abby Joseph, vice president Mariah Carter, health officer Lauren Joseph and president Eva Smalley. Outgoing president Macy Miller called the first meeting of the year for the Packrat Crafters 4-H Club to order at 7 p.m. on Jan. 19 at the 4-H Extension Office. After leading the pledges, Macy gave recognition to the outgoing officers and Eva Smalley, Emilee Wilson, Abby Joseph, Kendall Dye, Emma Miller, and McKenzie Vanslyke by presenting each of them with a plaque. Members answered roll call by naming their favorite color and the treasurer’s report was given. During the business meeting, the club voted on the club constitution and by-laws, discussed enrollment, fees and projects. Next, members voted on community service projects and then accepted nominations for new officers. Following the nominations, members voted by secret ballots and the new officers installed were health officer Lauren Joseph, safety officer Emilee Wilson, news reporter Abby Joseph, treasurer Samantha Moore, secretary Emma Whistler, vice president Mariah Carter and president Eva Smalley. Refreshments were provided by the advisors. Door prizes were won by Mariah Carter and Samantha Moore. The meeting was adjourned by Emma Miller and Emilee Wilson. 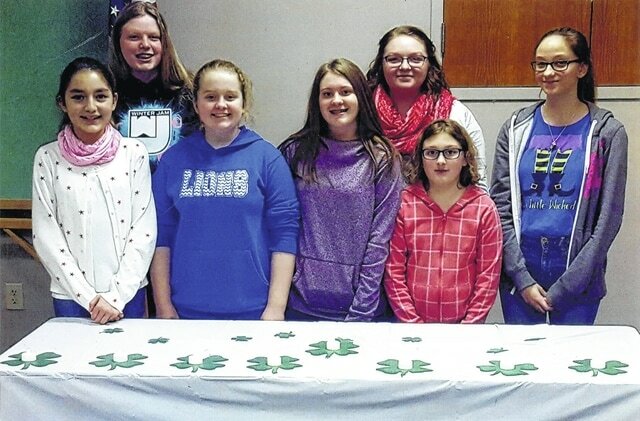 https://www.recordherald.com/wp-content/uploads/sites/27/2017/02/web1_PackratCrafters.jpgThe Packrat Crafters 4-H Club installed new officers for 2017 recently. Pictured (L to R): treasurer Samantha Moore, safety officer Emilee Wilson, secretary Emma Whistler, news reported Abby Joseph, vice president Mariah Carter, health officer Lauren Joseph and president Eva Smalley.